Explore virtual worlds and experience movies in a new way with a VR headset. You don’t need to have a $400 VR system and a gaming computer to enjoy VR games. This article will look at the 10 best VR headsets under 100 dollars. These headsets are great for those who don’t want/need a full VR system. You can use them at home or on the go. We’ll compare ratings, usability, platform compatibility, price range, and other features. 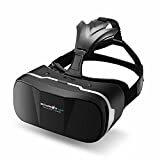 Thus, you will be able to pick the best cheap VR headset for your needs. Here are the top 5 best VR headsets under 100 that we’ve found, along with some quick information comparing the various models. The Clever Bear 3D VR headset is designed to fit a wide range of smartphones. Instead of the typical foam used on most VR headsets, the Amicool uses a leather face cushion that is non-sweat absorbing. The headset does allow you to adjust the lenses to some extent. Another feature that stands out is the Bluetooth remote controlled that comes included in the package. Price range-wise, the Clever Bear headset is on the cheaper end of the list. The IncrediSonic VR headset features an adjustable headband with a foam face cushion. The lenses are not adjustable, but the headset does come with a 5-year manufacturer’s warranty. On the bright side, the IncrediSonic includes a VR remote control that connects via Bluetooth to your Android device. 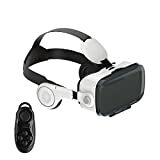 The Pasonomi VR headset allows you to adjust the right and left lenses from the top of the headset, and allows for a viewing angle between 70 and 80 degrees. The Pasonomi can fit smartphones with screen sizes beween 4.7 and 6.0 inches. Compared to other VR headsets, the Pasonomi is light at 0.57 lb. 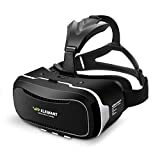 The virtual reality headset from Elegiant fits phones with screen sizes of 4 to 6 inches, though they recommend phone sizes between 4.7 and 6.0 inches. The face cushion is thicker than that of other headsets, for additional comfort. The headset has heat vents at the front to help keep the phone cool. 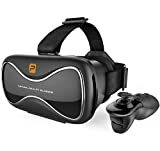 It is one of the best VR headsets under 100 due to the comfort it offers. The ETVR headset has a wider viewing angle than most other brands, which allows for a larger viewing screen, for better immersion. The phone holder is adjustable, to fit phones with screen sizes between 4.7 and 6.2 inches, and has rubber pads to better protect your phone. This headset is one of the lightest ones on the list at 13.4 ounces, and can be adjusted to fit a wide range of head sizes. In the Bnext VR headset, you can insert a phone with a screen size of 4 to 6 inches. Users have commented on the easily adaptable lenses, and the straps that can adjust to various users. The headset comes with a set of headphones, to enhance your VR experience. What is more, Bnext has some exclusive VR content included with the headset. With the BlitzWolf VR headset, you can individually adjust the lenses, to adapt it to any person. Its adjustable rubber clamp can hold phones with screens of up to 6 inches. For comfort, the headset uses perforated leather for the face cushion and for the adjustable headband. The headset is also designed to improve ventilation for your phone, and the cover can be removed for apps that need the rear camera. The Daydream View is made with a breathable fabric, and comes in different colors. For those that wear eyeglasses, the Daydream is designed to fit comfortably without having to remove them. Users can remove the facepad from the headset, and wash it when needed. The included remote contains sensors that provide smooth tracking and movement. One downside is that the Daydream is only compatible with a specific list of Android phones, but if you have the latest model, this shouldn’t be an issue. The Samsung VR headset is unique on the list, in that it’s powered by the VR company Oculus. What this means for you is access to over 800 apps on the Oculus App Store. The Gear VR controller has a touchpad and sensors, similar to a full VR system. The downside to the Samsung Gear is that the headset is only compatible with some Samsung phones, including the Galaxy Note5 and Note8, and the family of Galaxy phones from the S6 to the S8+. 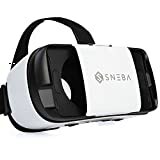 At the top of the list of best VR headsets under 100 dollars, the SNEBA VR glasses are built to be compatible with all smartphone operating systems, and various phone sizes. The headset allows for full adjustment of pupil and focal distance, to provide the best experience for any user. The nonspherical lenses provide a clearer picture. The padded and ergonomic headband provides additional comfort for VR sessions, and its lightweight design aides in the comfort of the user. On average, the SNEBA headset is on the lower to middle of the price range, and many users have been able to purchase it at a discount. Owning a VR headset doesn’t have to cost a fortune. 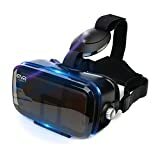 This list showed you the top 10 best VR headsets under 100 dollars, so that you can choose one that fits your needs. Both the Samsung Gear VR and the Google Daydream are quality products. However, their limited phone options placed the SNEBA at the top of the list. Do you own a VR headset that didn’t make the top 10 list? We encourage you to comment on any of the headsets that you’ve tried from the list, or any other that you feel should be on the 10 best VR headsets under 100 dollars list.